Nordic Walking Poles, now available at your public library! All you need is your PARL library card! What is Nordic Walking & Nordic Walking Poles? Nordic Walking is a highly effective low-impact fitness activity that offers the highest benefits for weight control and wellness. Nordic Walking Poles have a glove-like hand straps that encircle your wrist (and a thumb hole) and full size rubber feet enable you to incorporate over 90% of all your body muscles as you walk. 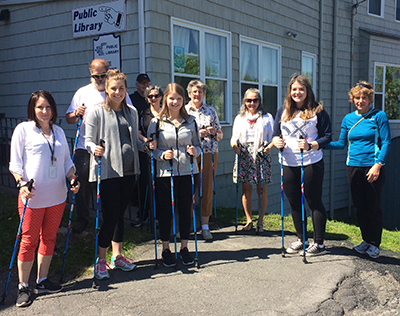 The Pictou-Antigonish Regional Library has 14 pairs of Nordixx Nordic Walking Poles, available to library patrons to borrow with your PARL library card! This service was made possible with a Walkabilities grant from the Nova Scotia Heart & Stroke Foundation. Numerous clinical studies show vast benefits of pole walking. While using poles contributes to faster weight loss, increased heart and cardiovascular health, even better posture, the activity is also of benefit for people recovering from knee or hip surgery. Biomechanical studies show the poles take off load from your knee and hip joints. You have up to 30 per cent less impact on knee joints and hips when you walk with poles.